* Oberammergau will be back in 10 years. This Tour is FULL and on WAITLIST. For questions, please contact alex@doldworldjourneys.com or (808) 732-9430. 11 nights in First- or Superior First-Class hotels. Modified First Class Globus. 11 (B) Full buffet Breakfasts; 2 (L) Lunches with one at a Swiss Working Farm; 7 (D) Dinners, three-courses with wine, including Welcome Dinner, Traditional "Grotto" Restaurant in Lugano, and a Special Dinner in Lucerne. Escorted by Alex Dold from Honolulu. Specially chosen tour director, Dino Koftis. Twin-bedded rooms with private bath or shower, hotel taxes, service charges, and tips for baggage handling. United Airlines from Honolulu. Private deluxe motorcoach with air-conditioning, extra leg room, and emergency washroom. 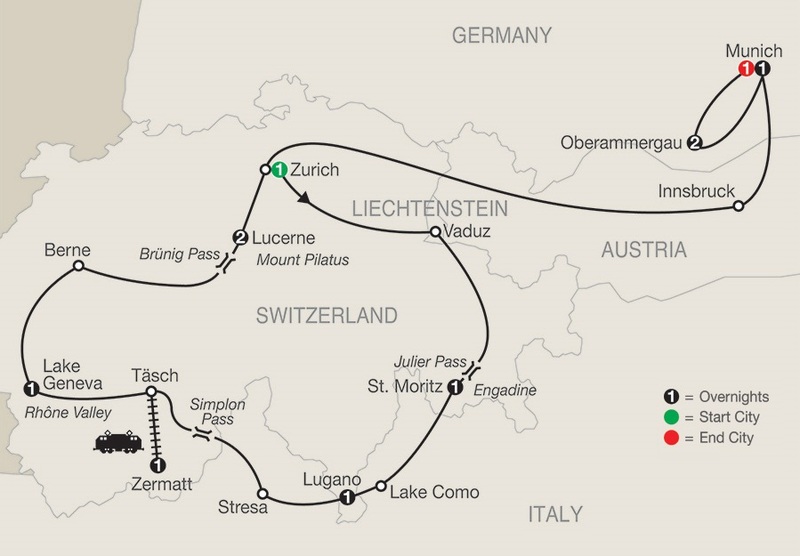 Horse Carriage ride through the Alpine Forest, Lake Lugano and Lake Maggiore Cruises, Mountain Train ride to Zermatt, and cable car ride to Mount Pilatus. Guided strolls in Zurich, Berne, Lucerne and Innsbruck. Orientation drive of Munich. Special sights are the Zurich's Old Town, the impressive Lion Monument, Lucerne's covered Chapel Bridge, Emperor Maximillian's Golden Roof, Munich's Marienplatz with it new and old Town Halls, and more. Unique inclusions like tasting traditional Chocolate Pralines at the famous Sprungli Confectionery, Horse Carriage ride in the Roseg Valley, visiting Berne's Bear Park, spending time a Swiss Working Farm, receive a special souvenir cap at Mount Pilatus, plus the Oberammergau PASSION PLAY. Scenic highlights abound with scenic Lake Zurich, Lake Walen, the Swiss and Bavarian Alps, Rhine Valley, 7,504-foot Juiler Pass, beautiful Engadine Valley, renown Roseg Valley, Italy's Lake Como, subtropical Lake Lugano, Lake Maggiore, lofty Simplon Pass, Swiss Valais, the spectacular Matterhorn, lower Rhone Valley, majestic Lake Geneva, the amazing Tyrolean Mountains, plus, plus, plus. While conjuring up this itinerary the vivid images of the most beautiful and pristine landscapes captivated me. Valley's considered by many as the world's most beautiful, deep-blue lakes, Mountain peaks exceeding 12,000 feet, airy larch forest, and adorable villages led me to give the program a more fitting name—The Swiss Alps. Add to this the famous cities of Zürich, Berne, Lucerne, Innsbruck, and Munich. Plus, unique experiences like samples of traditional Swiss Chocolate Pralines, a visit to a Swiss Working Farm, a trip to the top of Mount Pilatus, and, of course, the quaint little village of Oberammergau and its most amazing (chicken-skin) Passion Play and we have a Dream Journey in the making. Mahalo to Dino Koftis, our recent Central Europe Director, for his expert advice on tweaking the program for our Travel 'Ohana. One could say Dino is a male version of our amazing and loving Caterina Thiel (our exclusive Grand Tour Director for years). Having worked this area of Europe for 29+ years, Dino knows his stuff. Thankfully, he has also agreed to be our Director on this journey—God Willing! There are some hurdles when putting together a Passion Play program. It is very popular and the space is tight. There are two deposits required, both of which are non-refundable and I must estimate a few of possible costs which may arise in the next two years. Luckily this will be my family's sixth time hosting Hawaii groups to the magnificent Passion Play and I have never increase the price of a program in my 27 years in the industry. With this experience and the help of my Globus Family, I plan to be as flexible as possible and bring down the cost. All part of my continuing goal to keep my Family's Tradition of Value, Service and Making Travel Dreams Come True. Pray the program captivates you too! First 15 to sign up Save $100. Second 15, Save $75. The Globus family is NOT offering Journey Club Discounts on Oberammergau programs. World Explorations in the Dold Tradition of Value and Service! Contact us at alex@doldworldjourneys.com or (808) 732-9430.